← US, Get Over Yourselves! 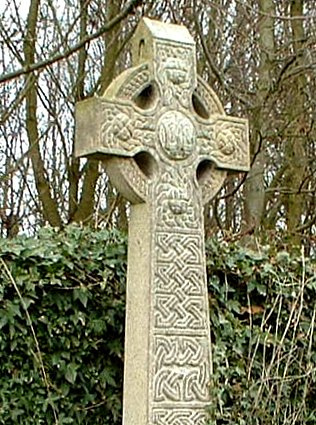 The circle in the Celtic Cross is the ancient symbol of eternity. It’s not easy, even if it is a lot of fun. To be a Celt is to regale in cheers and tears with equal zest, proud of the fact that the hard work that punctuated our wanderings wasn’t enough to kill us. We remember the “No Irish need apply” signs as if they were up just yesterday, and mourn the loss of our harsh yet expressive language. Many of us are, in fact, permanent immigrants – even across many generations. What I enjoy most about Saint Patrick’s Day isn’t the Guinness or the pipers, and it certainly isn’t the crowds. What moves me deeply is the realization that we have the stories and the stubborn Celtic memories that show the way for so many immigrants still arriving every day. While every immigrant story is different, every immigrant story is the same. The first generation suffers in silence, the next learns to fight. It’s up to the third generation to make sense of it all, and by the fourth or fifth the stories about grandma’s grandpa are all that remain. The hyphens are dropped, and Italian-Americans and Greek-Americans and Mexican-Americans gradually become plain Americans. We Irish were among the first to experience this, and our story leads the way. It believe is a lot to be proud of. This weekend, however, we can pull out the hyphens again and recall the stories and songs that every family gets to pretend are unique. They aren’t, of course, and if you change the dates and tunes a bit you’ll find the stories of nearly everyone else who came to this rugged continent of great opportunity and trial. 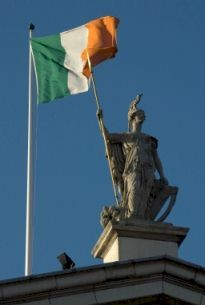 The tricolor over the General Post Office in Dublin, scene of the 1917 Easter Rising. What does it mean, in the end? As we wave the tricolor of Orange, Green, and White we aren’t just celebrating the day we add the hyphen back in. We are celebrating the ongoing story of the USA and every other nation that has been built by immigrants such as us. It’s our day, but it’s everyone’s day. We made it, you see, and you can, too. We haven’t totally lost our hyphenated status, but we made it both more personal and more universal at the same time. We don’t have to be Irish-Americans or Irish-Canadians because there’s a good hunk of Irish built into the definition of American and Canadian. In a few weeks, we’ll celebrate Cinco de Mayo in much the same way. Yes, there will be better food and better weather, and the people will on average be far fewer generations removed from the homeland. But the stories will have a similar ring to them, even if they aren’t quite complete yet. These stories might have a rawness that makes them more personal, but the lesson of Saint Patrick’s Day is that one day, generations from now, is that these stories will one day belong to all of us. We might break out the hyphens and mariachis just one day a year or so, but that will only come to pass because all the lines will have blurred. We will all be Americans, and the definition of what that means will have plenty of room for everyone. Our nation, like all nations built primarily by immigrants, is far bigger than most people can even understand. We do grasp this reality one day a year, one pint at a time, with plenty of stories and songs. It’s not really enough, but it’s a great time while it lasts. Sláinte! This entry was posted in Celtic and tagged Celts, immigration, Irish, St Patrick's Day. Bookmark the permalink. I hate the drunks, the whole bar scene is ridiculous. You can’t even get a drink in most places their so crowded. I’ll stay at home and have corned beef and cabbage with the fam, thank you. A beautiful sentiment & I know a lot of Irish-Americans who feel this way. We should never forget we are a nation of immigrants & we always will get the best from all around the world. Good blog! We do get the best. It takes ambition to make a fresh start in a land of opportunity. It;s too bad that the joy of St. Patrick’s Day is shadowed by today being the first day of the New Cold War. It is sad to say but we are relegated to repeating history. The cold weather is more of a damper on it here. Sleet is a killer. We are now living in an age of revolution, not of managed depression. Every once in a while history washes up on the shores of the US. It’s time to go to the beach. Just like in 1941, following the depression, it was time for the US to explore the world.